Not sure if you’ve ever tried to take a digital photo of the northern lights but it will most likely turn out grainy unless you have a very expensive camera (or you know some really good tricks and in that case please share!). 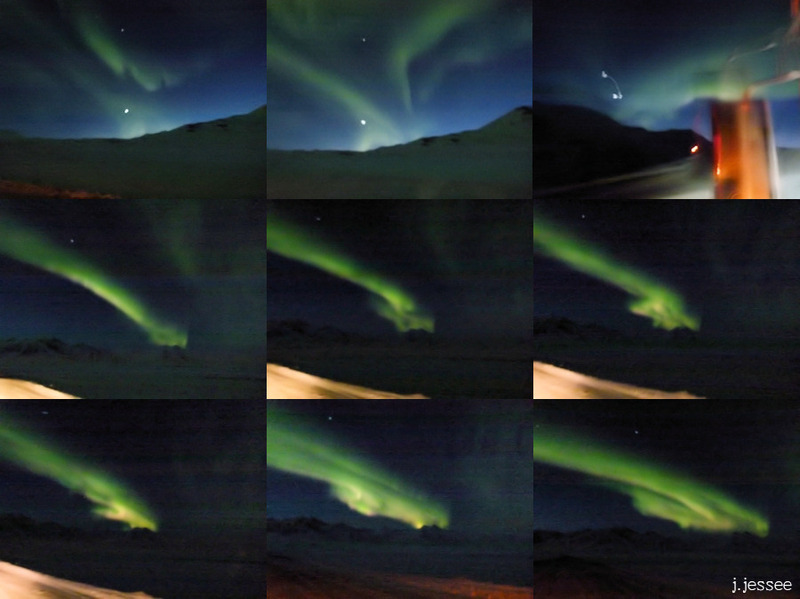 So I took 9 of Jack’s aurora shots and put them together in thumbnails after running digital camera noise removal on them a couple of times. If you don’t know what this means don’t worry about it, but the shots turned out kind of surreal. Click on the image below and check it out. You can see the side mirror in one of them – he obviously took the top 3 from the truck. The bottom 6 shots show one formation getting larger from at first just a wisp in the sky. The northern lights are a winter-only phenomenon for us since in the summer it’s light throughout the night, from May until August. This awesome kind of sighting is a big perk for us in the winter, and boy do we deserve it after months of bitter cold and darkness. Click here for a couple more shots of northern lights – these taken from our house. Have a great week!